Prizes and samples provided by Jeanne Walker Harvey. 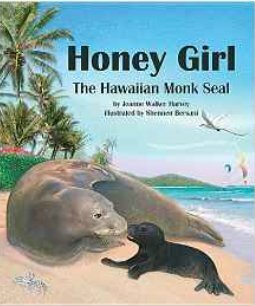 Heartwarming, true tale of a monk seal named Honey Girl whose courage and tenacity inspired all those who came to know and love her. Honey Girl was often seen swimming along the northern shores of the island of Oahu. Unlike most monk seals, she did not shy away from the beaches. One day Honey Girl was spotted offshore covered in green algae. She was injured by a fishhook. Scientists and veterinarians discovered that her tongue was cut in half and that she had not eaten in several weeks. Vets at the Honolulu Zoo operated and managed to save half her tongue. At first she was fed through a tube. Scientists knew that if she could not eat live fish, her return to the wild would be impossible. After thirteen days, she managed to catch and eat a live tilapia. She was placed in a crate and taken back to Turtle Bay to be released. A tracking device revealed that she was hunting for food. After a few weeks scientists caught her again to test her weight and strength. Not only had Honey Girl improved, but she was pregnant. Volunteers guarded “Super Mom” day and night while she nursed her pup named Meli. The following year Honey Girl gave birth again; one of her daughters becomes a mother for the first time. “Super Mom” is now a grandmother. This beautiful picture book with charming double page spreads is pleasing to the eye of young readers. 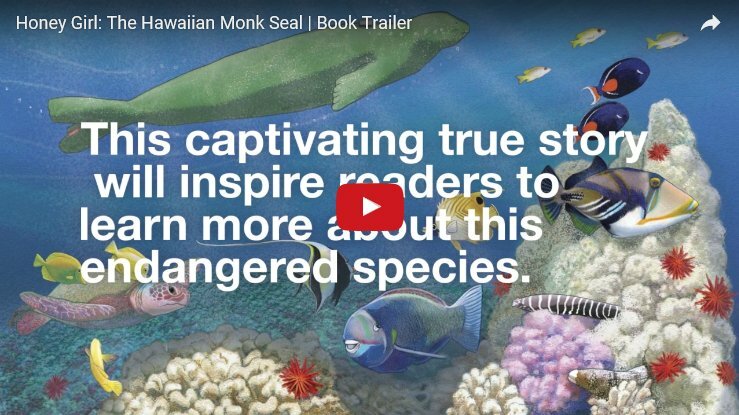 The poignant story teaches children about the environment as well as the work of scientists and veterinarians. Children in the primary grades who love nature and animals will want to read this book over and over again. Perfect for a bedtime story or family read aloud. If you enjoyed reading this review, please subscribe to my blog by clicking on the word Follow or by hitting the RSS FEED button in the upper right hand corner of this page. Wow! This book looks so good. I want to know the story myself so I know my kids will be intrigued! Thanks so much for linking up at Booknificent Thursday on Mommynificent.com this week! Sweet sentimental story with fabulous illustrations!